As the clock ticks toward the anticipated premiere of 24: LIVE ANOTHER DAY, a special half-hour behind-the-scenes preview of the event series, 24: LIVE ANOTHER DAY: JACK IS BACK, will air Saturday, May 3 (8:30-9:00 PM ET/PT) on FOX. Featuring interviews with the series’ Emmy Award-winning director, producers and series stars, the special takes a behind-the-scenes look at the action, cast and production on location in London. 24: LIVE ANOTHER DAY premieres with a two-hour television event Monday, May 5 (8:00-10:00 PT ET/PT) on FOX, and makes its time period premiere the following week on Monday, May 12 (9:00-10:00 PM ET/PT). And don’t miss 24: LIVE ANOTHER DAY encores every Friday at 8:00 PM ET/PT starting May 9. Set and shot in London, the suspenseful event series once again will follow the exploits of heroic agent Jack Bauer (Kiefer Sutherland), as he attempts to thwart an unthinkable terrorist attack that could change the world forever. Retaining the real-time, nail-biting, fast-paced format with split screens and interweaving storylines, the highly-anticipated series also stars Mary Lynn Rajskub, Kim Raver and William Devane reprising their original roles. Newcomers to the series include Yvonne Strahovski, Benjamin Bratt, Tate Donovan, Giles Matthey, Gbenga Akinnagbe and Michael Wincott. 24: LIVE ANOTHER DAY is a production of Teakwood Lane Productions in association with 20th Century Fox Television and Imagine Television. Howard Gordon, Evan Katz, Manny Coto, David Fury, Robert Cochran, Brian Grazer, Jon Cassar and Kiefer Sutherland are executive producers. The original series, which had its last American broadcast on May 24, 2010, was created by Joel Surnow and Cochran. “Like” 24: LIVE ANOTHER DAY on Facebook at facebook.com/24. 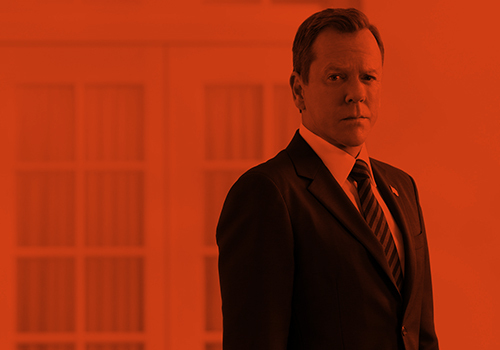 Follow the series on Twitter @24FOX and join the discussion using #JackIsBack. This entry was posted by Courtney on Wednesday, April 16th, 2014 at 12:44 pm. It is filed under 24: Live Another Day. You can follow any responses to this entry through the Comments Feed.